Allison Hulbert-Bruce’s original career plan may not have included a role in the wholesale plumbing and heating business that was founded by her grandfather in 1947. First she pursued an Associate’s Degree in Business Management from Champlain College and then a Bachelor’s Degree in Print Journalism from SUNY Plattsburgh. But growing up around the family business had a subtle influence and her love of home design has been put to use designing kitchens and baths for the business since she took a job in the showroom in 1998. VP Regional Banking Manager, Community Bank N.A. Originally from Heuvelton, New York Kent Backus began his career at Key Bank locations in Malone and Lowville. After 15 years he moved to HSBC in Massena and to a Community Bank branch there in 2007. A year later, Community Bank began acquiring Citizen Bank locations and he was asked to move to Plattsburgh as the regional manager. Overseeing 19 branches in a region he knows so well has Backus working directly with the branch managers and staffs, but he said the best part of his job remains inter- acting directly with customers. Originally from Elizabethtown, New York Jerry Rosenbaum stud- ied at Adirondack Community College and completed his degree at SUNY Plattsburgh. He worked for the Clinton County Real Property Office and was the Town of Plattsburgh Assessor before opening his own business in 1987. He has grown from a self-professed “general practitioner” to obtaining the highest credentials as a New York State Certified General Appraiser, which allows him to appraise more complex commercial properties for lenders. He works with his wife, Helene, in what he refers to as “a great profession”. President & CEO, Northern Insuring Agency, Inc.
Deena Giltz-McCullough is the third generation president and CEO of Northern Insuring Agency (NIA) with a staff of 38. The agency is headquartered in Plattsburgh and has branches in Massena and Whitehall. 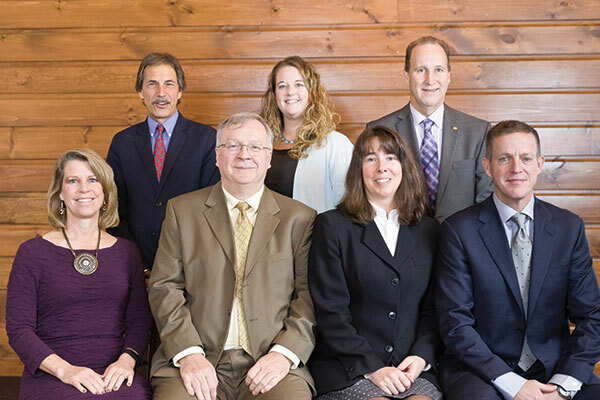 Accolades earned by Northern include Best Practices Agency, Best Companies to Work for in New York State, Galliard Excellence Award, and Plattsburgh North Country Chamber Business of the Year. McCullough is a visionary, using strategic leadership and extraordinary communication skills to promote the develop- ment and success of Northern Insuring Agency. Originally from Chateaugay, NY Mayor Calnon arrived in Plattsburgh to pursue a B.A. in Education from SUNY. He stayed on after college, owning and operating a couple of Plattsburgh nightspots for seven years. He then began a 30 year career in the public workforce develop- ment system, serving as president of the Workforce Association, and retiring in 2007 as Executive Director of the Workforce Investment Board. At that time, he was appointed to fill the last nine months of a City Council term. He went on to be elected to two full terms on the Council, serving as Mayor pro tem and budget officer for six years. He was elected mayor in 2013. Andrew Wylie’s career in some ways parallels that of his father, Robert W. Wylie. Both pursued undergraduate degrees (on opposite sides of Lake Michigan), graduated from law school and have had careers marked by high profile cases. Andrew joined his father’s Plattsburgh law practice and worked with him from 1987 until 2005 when he won his bid for district attorney. Two re-election bids and one prison break later, he remains dedicated to serving the community. In his spare time he supports the Plattsburgh FC Soccer Club which he founded, and together with wife, Natalie, acts as a part time Beachbody Coach, helping people achieve their fitness goals. In addition to his role as District Attorney, Andrew Wylie and his wife, Natalie, are small business coaches and are proud of the ripple effect their business is having in the community. “I am just as proud of the difference Team Beachbody is making in the community as I am of the job I do as district attorney. Natalie and I have been able to not only help hundreds of people change their lives by provid- ing them with a fitness and nutrition plan, but we have been able to help dozens of people start their own small businesses by becoming coaches on our team,” Wylie explained. All present at the table agreed that we have an opportunity to pros- per when everyone gets involved: Our economy grows when we support each other. “When you expand the waterfront and the recreational trails and places like the hand- icapped accessible tree house, and increase accessibility for biking and swimming, peo- ple are going to want to live in a place like Plattsburgh,” McCullough explained. “We have as much or more beauty here in the North Country as any place in the world. Our quality of life is unbelievable,” Backus added. Wylie emphasized, “Our focus should be on future generations and their connection to the area. We have to create opportunities for them. Wylie developed the Plattsburgh F.C. Soccer organization in 2002. “Plattsburgh F.C. is a community of soccer families dedicated to providing instructional and competitive youth soccer opportunities that enhance char- acter, community and love of the game,” he explained. An integral part of the organization is the building of self-esteem, self-confidence, team work, respect for self and others, and the inherent benefits of physical exercise. The hope is that the addition of things like a strong soc- cer community can be another in a series of positive draws for young families to stay and grow roots in the region. As is often the case, getting the word out about these types of opportunities and our natural resources can be an issue. “How do we let more people know through networking what is avail- able in our community?” asked McCullough. “If downtown had more to offer, we could get people to come into the city and stay longer. The best mix would include a more diverse group of retail offerings — not just restau- rants and bars — and the available parking required to support additional business traf- fic. We have to go to Burlington to do certain types of shopping. If I want to buy a new suit, I have to go to Burlington or Albany or Boston. We don’t have Merkel’s (Department Store) anymore. It would be nice to have those things come back into the city,” Wylie stated. Finding ways for existing businesses to bring out the best in each other as we expand the core base of businesses is on McCullough’s wish list. “I understand the evolution of busi- ness and that people want to retire and make the best place for themselves in the world, and yet is there some way that those of us who are surviving and thriving here can continue to support each other?” McCullough asked. Focus on the next generation and continu- ity is another path toward creating a rich and vibrant community in which to live and work. “My wife and I have brought our son into the business as our succession plan. But I realize everyone doesn’t have that opportu- nity. It requires hard work and planning to prepare the next generation to run the busi- ness,” Rosenbaum confided. “Finding the bodies isn’t necessarily the chal- lenge.It’s finding the people that have the desire and work ethic to do the job that needs to be done,” emphasized Backus. “The hiring process is like dating,” explained McCullough. “ You have to figure out if some- body is going to be a good fit. Do they have the things you can’t teach people: values, work ethic, honesty, timeliness, the sense of urgency, the drive to succeed and be part of a winning team day after day? That needs to be inherent in somebody. I need someone who was raised that way.” “When you really look at the whole package of education, we can train people for the skills they need. Finding the basic raw materials is really important,” said Mayor Calnon, referring to the ability to find great raw talent in all the area schools. Rosenbaum’s profession has unique work- force issues. “We’re a graying profession. Two-thirds of the appraisers across the coun- try are over 50,” he explained. “2016 will be the first time ever that certified appraisers in New York State will need background checks to inspect properties for adherence to appraisal requirements. These and other strict requirements are contributing to fewer prospective appraisers,” he added. Wishes can come true, especially with a lot of hard work and awareness. The most important part of our region’s continued success, as Garry Douglas pointed out in his closing remarks, is working together. That cooperation is informed by open commu- nication to clearly define a direction that addresses the current issues. We need to have the substantive conversations about issues and possible solutions to develop a way forward.